Most of my snack shopping takes place in relatively predictable places like convenience stores, supermarkets or snack shops. Very occasionally, something interesting will show up in one of the local green grocer's catch-all bin of snacks and low price foods near their registers. The shop these were purchased at is a bit grungy, but the prices for vegetables, fruit, and meat are low. The snack foods in the big bin are often a jumble, and sometimes look worse for wear. The boxes can actually look beat up, scratched, or worn on some foods; it's like someone kept them in the back of their cupboard for a few months then decided to sell them. Normally, I ignore the snacks at this green grocer, but my husband plucked this bag of brown sugar bread out of the bin while he was foraging for Portuguese strawberry cookies that they had recently started carrying. The shop I bought this from is called Takano and we paid 198 yen ($2.20) for a package with 10. Each is 20 grams (.7 oz.) and 7.5 cm. x 5.5 cm. (3 in. x 1.2 in.) in size. I'm not sure if you can call that size "jumbo" or not, but they are big for a cookie-like treat in Japan. Though these are called "bread", this is one of those times when translation doesn't work very well. These are more like a cross between a bread and a cookie. They are a variation on the classic Japanese "tamago pan" (egg bread). 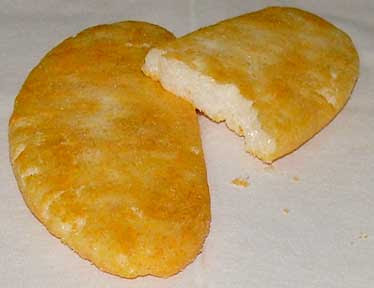 That means they are firm, dense, and have a somewhat crispy exterior with a dry, but tender interior. They are a small carbohydrate bomb, and eating them is as much about texture as taste. 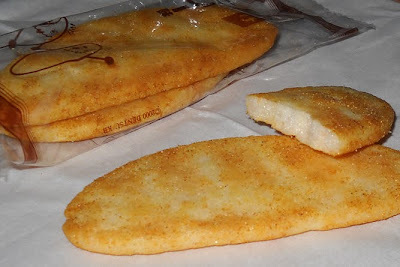 The ingredients include flour, brown sugar, white sugar, egg, and margarine. These smell of molasses and brown sugar and unsurprisingly taste fairly strongly of brown sugar and molasses. They are quite sweet, but not in a throat-burning way. 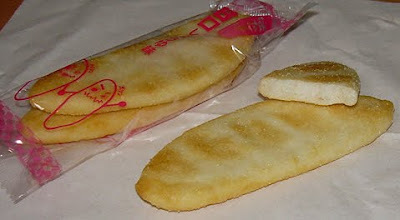 Like other types of tamago pan, they have a slightly crispy exterior, and a dry, cookie-like interior. They are very satisfying with a cup of coffee or tea as a more substantial snack. I liked these a lot, but I love the sort of dense, dry cookie-like interior these have. They remind me of the sugar cookies my mother used to make, which were not your usual crispy, sweet sugar cookie. I find the texture of tamago pan immensely satisfying. The flavor of these is icing on the cake. I can recommend them without reservation to people who like similar types of food, but I'm not sure they'd be a knock-out winner with just anyone. In Japan, variety packs are called "asooto" (アソート) which is the Japanized version of "assortment". This Bakauke pack of 40 sembei in 5 flavors has been in my line of sight for some time. I resisted it because of the hassle associated with reviewing such packs (more pictures, more writing, same number of posts), but also because I think it'll take me a very long time to eat all of this myself and my husband doesn't eat sembei. In the end though, the price and the fact that I could sample a lot of flavors that I've been considering purchasing individually made me take the plunge. I found this at a discount snack shop for 269 yen ($3.12). I'd also seen it for a somewhat higher price at Peacock supermarket, but it's not the sort of thing that tends to show up in just any old market. I think this would be a good thing to have on hand if you tend to have a lot of visitors to your home or have a family and can eat it quicker than the likes of me can consume 40 sembei. 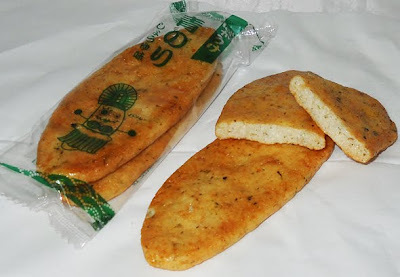 Like all bakauke sembei, these come in a banana shape. The package doesn't offer nutrition information for each flavor, but I'd guess that they are similar to the other flavors I've reviewed and are about 20-35 calories each per cracker. My guess is the black sesame one is higher in calories than the other varieties. The strange thing about this soy sauce cracker is that it neither looks nor smells like the typical "shoyu" variety. It's not covered with a semi-sticky veneer of soy sauce. This does small very faintly of soy, but also vinegar. In fact, the predominant taste is a mild vinegar one, not a soy sauce flavor. This reminded me more of a very subdued version of the "Happy Turn 200%" sembei. That's not a bad thing at all, but I think this could have been a bit more intense in flavor. Nonetheless, this was perfectly enjoyable despite its lack of strong spice. For some reason, this cracker is wrapped individually while the others come two to a pack. 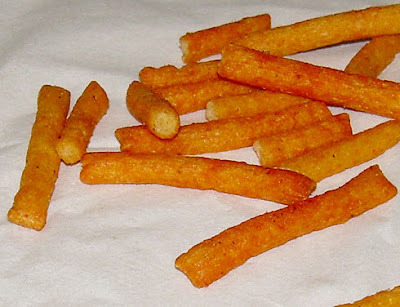 This is the most "fried" one and is bumpy and super crunchy. It smells lightly of sesame and of soy sauce. The exterior is very shiny and quite appealing to look at. These have a mixture of sweet and savory flavors including honey. All of the components come together well to present a multi-layered taste experience with all of the flavors complimenting each other well. I really enjoyed this. This was the flavor that I had the lowest expectations for because I'm not a huge fan of nori (seaweed). It's not that I can't eat it or find it gross. I can certainly consume it, but if I have a choice, I'd prefer not to have it included in foods that I eat. That being said, this is the sembei for those like me who are indifferent toward nori. The base soy flavor is deep, savory, and complex. The amount of small flakes of nori are enough to make the flavor present, but not overwhelming. The only bad point about this one is that the outside is a bit sticky so you need to eat it with the wrapper on or be prepared to wash your hands after touching it. This smells lightly of Japanese curry roux blocks, which is to say that the scent is somewhat different from actual curry powder and miles away from real Indian curry. The flavor is mild at first, but builds up a bit on your tongue by the end of a second cracker. There is no heat whatsoever in these and they're mildly salty. I get the sense that these were designed for people who have what is called a "cat's tongue" in Japanese. That is, they are sensitive to foods that are hot in a spicy way. While certainly a nice enough and completely enjoyable cracker, I have more of a "dragon's tongue" (I made that up, it's not Japanese) and would have liked some heat. I'm going to be a bit lazy on this one and tell you that this is exactly the same as the Bakauke cheese sembei that I reviewed previously. There is no difference between what you get in the bag devoted to "5 cheese" sembei. This is a good thing because I gave those a "happy" rating and thought they were like a higher quality Cheeto cheese flavor. 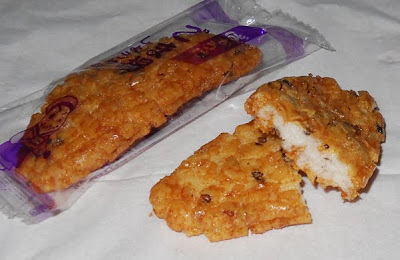 This was a great value and full of high quality, flavorful, fresh, and crispy rice crackers. If you like sembei, or are going to buy some to send home to people who enjoy it, this is one of the best choices you can make. Despite my initial reservations about buying so much at once, I wouldn't hesitate to buy this assortment again, particularly if I wanted to serve some to guests or keep a stash on hand for late-night T.V. viewing accompaniment. A regular KitKat White bar, that is the type with four fingers, has been available for ages. My husband bought this one because he likes white chocolate and thought this sounded good. Personally, I'd already passed on it as a KitKat which has white chocolate instead of milk didn't sound like much of a variation. 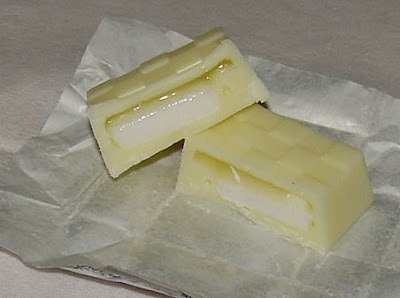 However, this being a big bar makes it a bit more appealing because of the higher wafer to white chocolate ratio. This smells like vanilla and white chocolate. 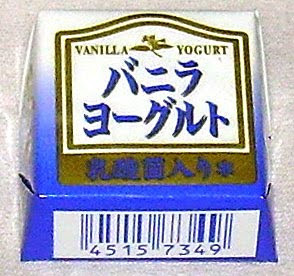 For Japan, a white chocolate bar which actually smells like vanilla is rare since much of what you get with white chocolate here is a powdered or condensed milk flavor. 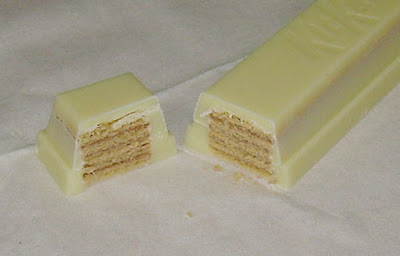 The texture is super crispy row of wafers with firm white chocolate, as one would expect from a big KitKat. The bar is a whopping 44 grams and 12 cm x 2.5 cm x 2 cm (4" in x 1". x .8") in size. The real acid test of this is the taste and whether or not it's going to be overwhelmingly sweet. It is quite sweet, but is good quality white chocolate and has a classic (American) sugar wafer flavor. I love that grainy sugary sugar wafer flavor and I did enjoy this bar. If I were in the right mood, and could stop myself from scarfing down all 244 calories at once, I'd definitely buy this again. That being said, I would have to really be in the mood for something quite sweet. You can pick these up at nearly any major convenience store for 105 yen ($1.16) for the time being. Chances are this will be rotated out of the standard stock selection at some point, but you can also be sure that it'll come back around again in the not too distant future. Click on this picture to see a somewhat bigger one. There's a 100-yen shop that I rarely go to because it's relatively far from my house. 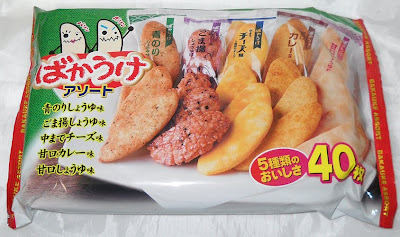 As is so often the case, they stock snacks that are rather different from those at the other 100-yen shops. 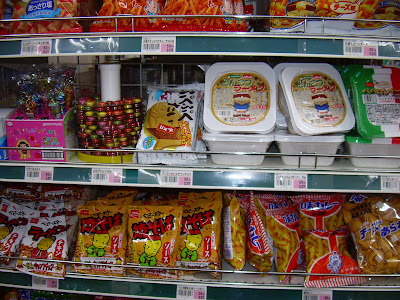 My husband said that the ramen package design on the top shelf (on the right) reminded him of the South Park 3D versions of their characters. Next to the ramen is a monaka version of taiyaki and a spindle of "marble choco", the Japanese version of M & M's (which really aren't that good). The bottom shelf has soy sauce Baby Star ramen snacks and some sort of curry-flavored curl which I hope to review some time. Having grown up in the United States, I've often felt bigger is better, particularly when it comes to food. After living in Japan for quite some time, I've come to realize that bigger isn't necessarily better. It really depends on what you're talking about, and those of you with dirty minds have no doubt rushed to some interesting conclusions. How do I know you're doing this? Well, I was there way ahead of you. This bar smells like yellow circus peanuts and the taste is of very strong banana flavor. It's very sweet and actually tastes like banana circus peanuts minus the strong esthers flavor which makes that candy so gross. As fake banana bars go, this is pretty good, but so sweet. It has more of what I'd call a "candy" taste to it than a chocolate one. This bar will set you back 243 calories for a 44 gram (1.5 oz.) bar. You can buy it for 100 yen at most convenience stores right now. I give it happy rating if eaten in small doses. I think the sweetness would make it hard to eat too much at once. My husband, on the other hand, would give it a "very happy" rating as he likes sweeter things and banana-flavored treats more than me. And, yes, banana-flavored stuff is pretty hot right now. It's everywhere in Tokyo, so you're likely to see more in the near future. 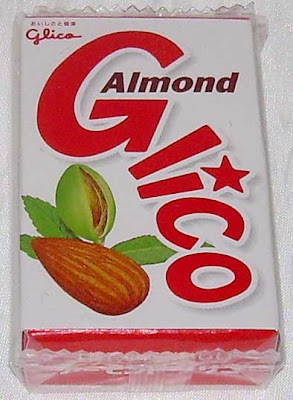 The picture of the Glico man printed on the back of my small box of almond chews is very tiny. The normal details of an illustration of a man running with arms raised as he crosses the finish line now appear to be a naked man censored with three white blobs with the characters for gu-ri-ko written on them. It's nice to see that even the most innocent and wholesome of corporate mascots can be perverted if the mind viewing it is dirty enough. Here's a bit of trivia for you about Glico. Though it is well-known abroad for making Pocky, it's first product was a caramel made from glycogen. The company's name comes from that ingredient. Ironically, caramels are nowhere to be seen on their web site's main attractions. 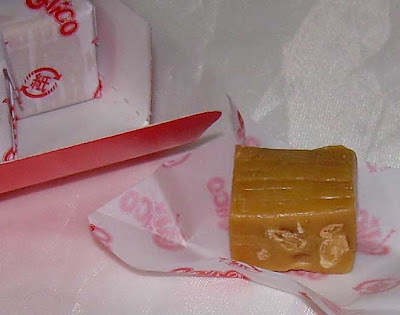 I'd been seeing this box of almond chews in Okashi no Machioka for a very long time. It's one of the things which is always on offer in the section with kid's candy and old-fashioned candy. The standard size box is 18 chews and similar to the plethora of caramel and chewy candies you find in Japan, but I didn't want to get such a big box considering it takes me about a month to consume all of it and once the plastic outer wrapping is removed, the chews (or caramels) get moist and icky before I can finish them. Recently, a smaller box was for sale for 49 yen (54 cents) so I snapped it up and took the plunge. There are 10 chews in the small box that I bought. Each is individually wrapped in wax paper and they're 19 calories per chew. The size is about 2 cm x 1.6 cm x 1 cm (.8 in. x .6 in. x .4 in. ), so they're not very big. You can see cross sections of almonds in every chew, though the density of nuts is not all that high. The candy smells like nut candy. It's like a much fainter versions of what you smell when you open a box of nut brittle. The flavor is an interesting balance between sweetness, nuttiness, and subtle caramel flavor. It's not overly buttery, nor heavily sweetened. The nut flavor does not come through exceptionally strongly either, but it all comes together to create a unique flavor mixture and texture that doesn't overstate any of the components. Sometimes I try something and I like it, but there are negative points to it such that I'm not likely to have it again despite actually enjoying it. That was my experience with these Tyrant Habanero Wasabi sticks. I liked them, but there were a few sticky points (not as in actually sticky) that make a revisit unlikely. I bought these at the same time as the "Tyrant Habanero" garlic sticks at the same place, AM/PM convenience store. The size is the same, 35 grams (1.2 oz. ), as are the calories at 175 for the whole bag. These are about 130 yen ($1.44) and have a similar list of ingredients to its brother product. The primary ingredient is potatoes and there are a ton of nice savory spices like garlic, onion, and meat-based flavorings. Of course, this one also includes wasabi. Unsurprisingly, these smell like wasabi. 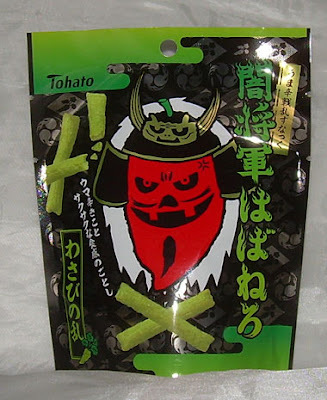 The first bite is intensely strange and almost medicinal, but that blows off after you eat a few and then it's a nice wasabi flavor with consistent heat that starts to punch you in the back of the nose as you eat more. As is so often my experience with wasabi, it doesn't accumulate heat on your tongue, but punches you nasal passages. I strongly recommend a beverage to mitigate this effect to some extent. The texture is nice and crunchy, not too airy or dense, but there is a bit of a greasy sense underlying them. This greasiness was less present in the garlic version that I reviewed before. I liked these, and I ate the whole bag at once, but the truth is that I wouldn't buy them again because of the weird medicinal starting flavor and the greasiness which coated my mouth for awhile after I finished. Those negative points overcame the positive ones of the nice taste, heat and texture. 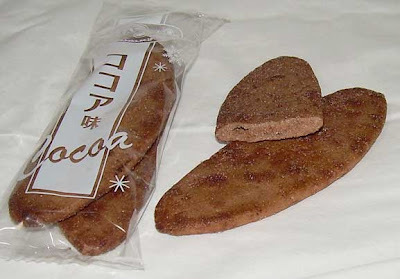 This is the latest in Tohato's "All (fruit name)" series of somewhat healthy cookies. Previously, I sampled their "All Osatsu" (sweet potato) and "All Cranberry VE" cookies and rated them both positively. I had somewhat lower expectations for these banana cookies since, if there's one thing sweets makers can manage, it's to screw up banana-flavored treats. That being said, I was game to give these a try to see how Tohato did with giving them the "All" treatment. 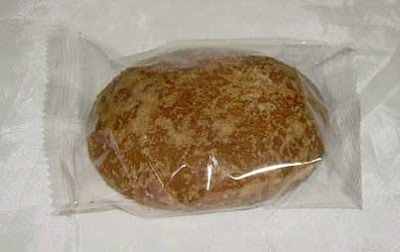 A bag of these contains 14 cookies that are about 5 x 4.5 cm square (2" x 1.7"). I bought these at Tomod's drug store, but I'd be surprised if you couldn't find them in most grocery stores in Tokyo. Each cookie is only 29 calories. The process of making these cookies is offered with an illustration on the side of the bag. They show a layer of cookie, a 10-cm. (3.9 in.) layer of bananas and another layer of cookie. Apparently, they press a ton of banana between the two cookie layers to make the somewhat chewy, but still soft morsel pictured above. I've sniffed a lot of snacks (recreationally, I'm not a hard dealer in snacks or anything) since starting this blog, and these smell better than any banana treat I've tried in my life. They smell like strong, real banana. In fact, the closest thing I can describe the scent to would be banana chips. These have a nice natural banana flavor, like dried, moist real banana mixed with a generic cookie and cake hybrid flavor. 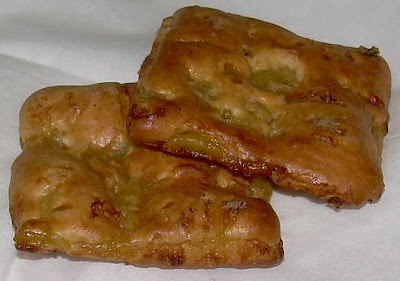 It's very lightly sweet, and gets most of its punch from the banana filling. The ingredients list starts with flour and then goes to the banana followed by sugar, grape sugar, margarine, shortening, and eggs. Somewhere down the list is also cinnamon. That's an unusual inclusion in cookies in Japan. If you like bananas, I strongly recommend trying these while they're still available. They taste great, have a good texture, and they keep very well. If you're looking to snack on something a little healthier when the old blood sugar drops, these would be a good choice to keep in your desk at work. Two or three of these with a cup of tea really hits the spot. This is another round of shameless self-promotion. You may feel free to metaphorically pelt me with rotten fruit for doing this, but don't try it literally. The Japanese don't take kindly to things like that. I did a guest post on the blog Food in Real Life. It's a site that is dedicated to comparing how food is presenting in advertising and packaging, and how it appears in real life. I subscribe to it via RSS, and recommend others give it a look as well. My guest picture and descriptions are here. I rarely do those "you know you've been in Japan too long" deals, but this Tirol chocolate is providing me with an irresistible opportunity to offer one. I've been here long enough to have developed a long-term affinity for a product that didn't originate in my home culture, which I imagine means I've been here too long. There's a type of "fresh cream" vanilla yogurt that I have enjoyed for a very, very long time. The label of this Tirol chocolate is based on the package design of that yogurt and I was very excited when I saw it in Family Mart. It didn't take me long to part with my 30 yen (33 cents). 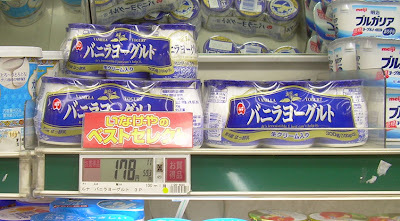 This particular brand of yogurt, sold under the brand name "Luna" (ルナ) is sold in convenience stores and markets. You can get it in two or three container packages. Each pot is quite small and the yogurt is like a dessert. Its smooth, creamy, sweet, and full of lovely vanilla flavor. Part of the reason that it is so good is that it is 4% fat. That means that a small quantity (about a half cup) is 111 calories. The slogan on the package says, "it's irresistible, I just can't help it." And it is truth in advertising. Since the yogurt is so incredibly good, the bar for this candy is really high. I wanted to judge it fairly, but I also felt that there's only value in this sort of cross-company venture if something special comes out of it. When I opened the package, there was a scent of heavenly sweetness and vanilla. The smell was a good start. The texture is soft chocolate with a soft marshmallow with a little syrup mixed in. Because they're both soft, you can't separate the textures of the two. I wish the marshmallow had been a little more distinctive in terms of texture so it would have added depth to the feel in my mouth. The taste is quite sweet white chocolate with just a little bit of yogurt sourness. To be fair to the formula for this candy, I should say that the vanilla yogurt it is based on is not particularly sour. That being said, this is a pale imitation of the yogurt. There's too much sweet white chocolate and too little of the vanilla essence. You can also smell more vanilla than you can taste, but at least the taste is there. Don't take the rating the wrong way. This was nice. I enjoyed it, and I think others who like white chocolates and yogurt (in moderation) will like it, too. I just think that if I'm going to spend the calories, I'd rather buy a pot of the real deal and eat the vanilla yogurt itself. This 1 inch/2.54 cm. 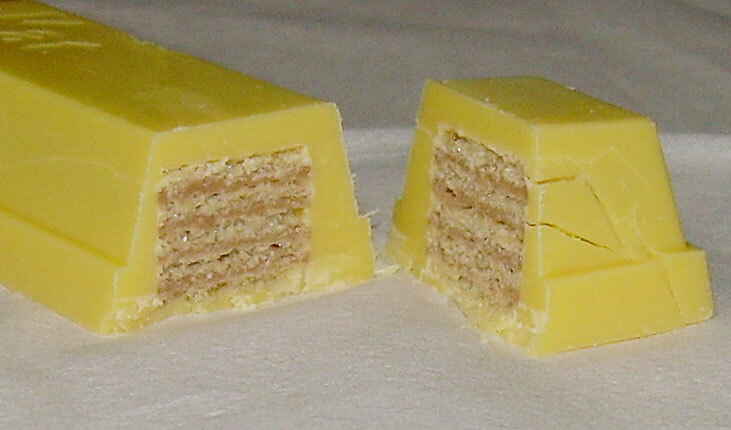 square of Tirol candy has 47 calories. For about the caloric cost of two of these squares, I can have the real deal which has more substance, better vanilla flavor, less sugar, and a decadent smooth and creamy texture. I happily consumed this, but I wouldn't buy another. Incidentally, I haven't reviewed the yogurt itself on this blog, and I'm unlikely to with so many other things lined up, but I recommend it without reservations. If I were to rate the Luna Vanilla Yogurt, it'd get a very happy rating without reservation. Just writing about it here is making me crave it rather strongly. 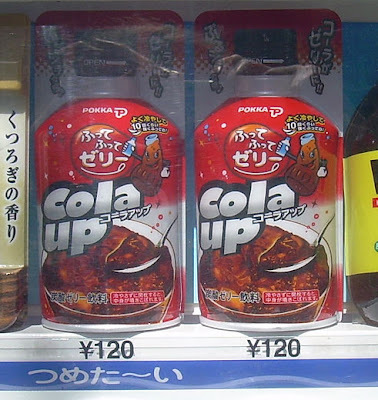 Bottles of cola-flavored gelatin dessert are being sold in a Pokka vending machine near the end of the street I live on. I'm not sure if you're supposed to eat it with a spoon as the picture on the label indicates, or if you're supposed to drink it as the bottle shape seems to imply. Either way, I'll keep my 120 yen ($1.33). Note that "up" is often used in Japanese English as a way of saying "increase". I have to constantly correct students who think it's correct to say "level up" or "skill up" when talking about improving their abilities. I've had wonderful experiences with Bakauke sembei and was drawn to this cocoa sembei the minute I saw it. If nothing else, I love the package design. The mascots in black look beautiful against the sea of dark cocoa powder and the gold lettering adds a sense that these are going to be rich and chocoaltey. All in all, one expects a pretty high class experience. I found these at the discount snack shop, Okashi no Machioka. They were 178 yen ($1.95) for a bag of 18 crackers (9 packs of 2 rice crackers). I was further intrigued by these because each 2-pack is only 33.6 calories (yes, it actually says "point six" in the nutritional information). Chocolate treats for a low calorie cost has convinced more than one woman to sample a food hoping to find the holy grail of chocolate; that is, the enjoyment without the high price of cocoa-based goodness. Each cracker is fairly generously sized, and smells faintly of cocoa powder. They don't have any of the telltale smells one associates with rice crackers or baked rice products. The taste is relatively mild in some ways, and somewhat blunt in others. 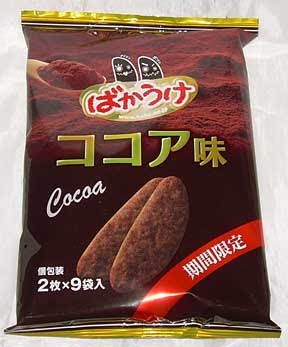 The cocoa flavor is pure, like cocoa powder, but there is relatively little sweetness and salt. This makes the experience feel somewhat flat when you aren't hitting on a pocket of salt on the exterior of the cracker. Both sugar and salt enhance flavor, and I think this really could have benefited from a bit more of one, the other or both. I wanted to like these. They have a great texture and aroma. They're low in calories and sugar (they're made with Sucralose artificial sweetener) and they have lots of cocoa. Despite having all the components one might want, it just didn't come together to please my taste buds. The flavor was just too thin. I'll certainly finish the bag, but I won't buy them again. If you're interested in downloading desktop pictures of each calendar month from Bakauke featuring their mascots, you can get one here. My husband and I have adopted a weekend habit of walking along the long and winding shopping street near our home. This is always a pleasant way to spend some time getting some exercise and doing some necessary shopping. Unfortunately, it has also brought along a less useful habit of checking out snack shops and buying up whatever catches our fancy. My buffer of posts is growing bigger and bigger, as is my stash of uneaten snack foods. During one such stroll, we went to Okashi no Machioka and came across some bargains. We bought some KitKat mini flavors we'd been ignoring at their original price of 300-400 yen, but were now on offer at a discount. 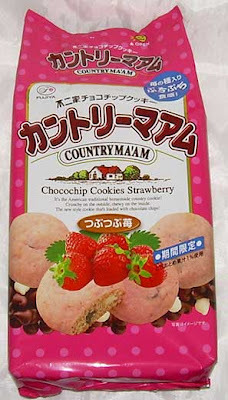 We also picked up some new items including these strawberry cookies. My husband being an aficionado of all things strawberry (and banana) snapped them up for about 280 yen ($3.10). Note that we sampled one strawberry cookie in this brand as part of a variety pack before, but it was a different cookie than these ones. The package contains 16 small individually-wrapped cookies. Each is 4 cm in diameter (1.6 in.) and 49 calories. 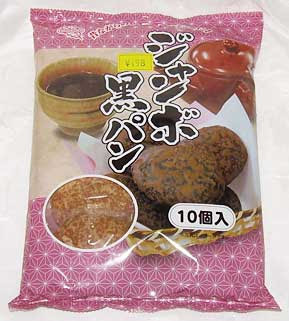 The front of the bag says that these are made with "tsubu tsubu" or "pebbly" strawberries. That is a reference to the fact that little bumpy bits of strawberry can be seen in the coating on the top of the cookie. Like all Country Ma'am cookies, these are slightly crispy on the outside and tender and chewy on the inside. They also are better when heated in the microwave or toaster oven. I've got no issues with these cookies on the texture front. The problem I have with them is the taste. At first, the strawberry hits you rather mildly and pleasantly, then you get to the chocolate chip cookie flavor in the center. By the end, when the somewhat sour and tangy strawberry flavor starts to flower in your mouth, the combination tastes discordant. I think the strawberry flavor which worked pretty well in the previous non-pebbly variety isn't working so well here. Perhaps the little bits of fruit make the tart strawberry flavor a bit too intense such that it doesn't make a nice pairing with the chocolate chip cookie. My husband would give these an indifferent rating. He'll finish the bag, but wouldn't buy them again. I would be tossing the rest of them out because I just found them unpleasant. My readers may (or may not) have noticed that I haven't reviewed many Japanese KitKats as of late. There are two reasons for this. 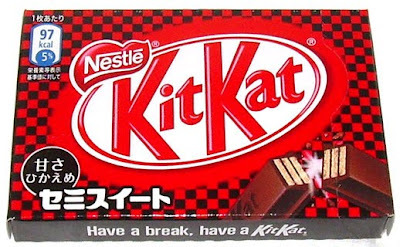 One is that Nestle Japan has slowed down their release rate a bit now that the peak studying season is over and parents might be less inclined to buy KitKats as forms of encouragement for students prepping for exams. The other is that I believe I have come down with Japanese KitKat Fatigue Syndrome (JKFS). That's when you sample so many of these bars that they all sort of run together. It doesn't help that Nestle is starting to recycle flavors at a record pace. When my husband brought home this latest bar and plonked it on my desk, my first thought was of the Okashi no Machioka special "mild bitter" bar. That bar was a dark chocolate bar, as is this one, and was mild bittersweet chocolate. It was fine, but nothing to write home about... not that I ever actually write home anymore since I have Skype, and not that I'd ever write about KitKats. I've got other boring details of life to put my family to sleep with. Incidentally, I love the bold design of this bar's box. 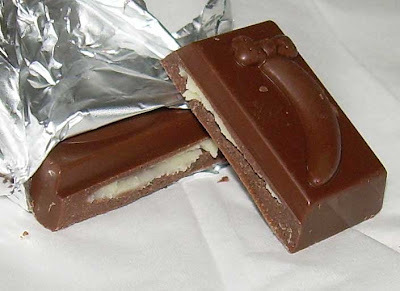 At first, I thought it might be some Grand Prix-related release because the checkerboard pattern reminds me of car racing, but I didn't read about any connection between this bar and racing on the KitKat web site. There may be one, but I've missed it if that is so. 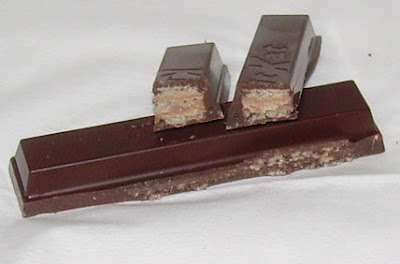 Fortunately, this bar has bigger flavor teeth than the mild bitter mini bars that I reviewed before. It has a stronger dark chocolate flavor tempered with sweetness. It smells very good in a way that shouts "chocolate" more loudly than a regular bar. It's missing the usual milkiness, but has a similar sweetness level to the regular KitKat bar. The chocolate is also slightly firmer than usual as one might expect from a bar with less milk. These are 97 calories for 2 fingers, which puts them a few calories lower than most conventional KitKats. If you like dark chocolate, but don't like it as strongly on the bitter side, this may be very appealing to you. These bars were released on March 15, so they'll probably be around for awhile and you can get them at any of the major convenience stores for 100 yen ($1.11). I can't say that this is a "don't miss" type of bar, but it really is quite good as a variation on the standard milk chocolate KitKat. It doesn't stand as a novelty Japanese KitKat, but works well simply as a semisweet chocolate candy bar. I studied psychology with a fairly strong emphasis on biology and behavior. One of the things I learned about was how and what stimulates the brain in a particular manner. In particular, the brain responds to pain by releasing counterbalancing pleasure chemicals. This is one of the reasons people like to eat foods that are hot and spicy despite the sometimes painful burn associated with them. It is a way of tricking your brain into juicing you up a bit. Whatever the reason may be, I love hot and spicy things and the "Tyrant Habanero" product line always catches my eye. You can identify them in Japan by the evil jack-o-lantern red pepper mascot that graces every bag. There are only two things that keep me from having a constant supply of these snacks on hand, the calories and the fact that they taste great going in but are far less pleasant on the way out. 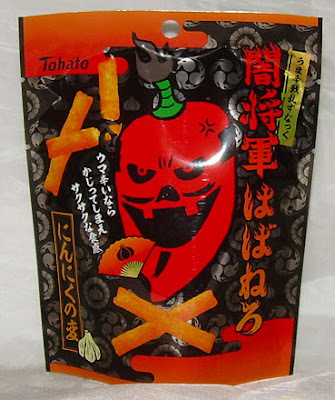 I came across these stick-style garlic habanero snacks at AM/PM convenience store. Those who want them have to get them at "conbini" as they are not sold in other types of shops. I'm afraid that I don't remember exactly what I paid for this 35 gram (1.2 oz.) bag, but I think it was around 130 yen ($1.44). The entire bag is 175.5 calories, and that's not bad for the quantity of salted snack sticks. When I poured a few of these out to take the picture, I was reminded of some sort of spicy or barbecue snack stick that I had on rare occasions as a child and really loved. 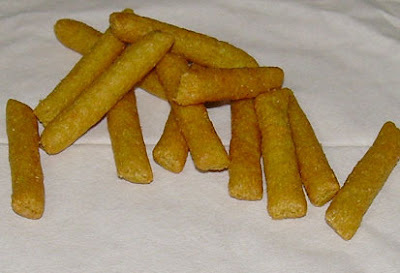 I have a strong sense that the brand name was "Popeye" (and a company named "Allens" makes Popeye potato sticks, but their web site is mum about snack foods), but I couldn't find anything on the web that resembled what I recall. Part of the problem is that Popeye's fried chicken is talked about so much that anything with "Popeye" and "spicy" brings up a chicken-related result. If anyone remembers what I'm talking about, I'd love to hear about it. These sticks are not very long, about 4 inches or 10 cm each. They have a really perfect potato-based snack texture which is airy enough to be light and crispy but not so much as to feel like nothing. The spice at first carries a heavy garlic flavor, unsurprisingly, but the cumulative effect of the heat soon squashes that out of existence if you keep eating. And, oh, I kept eating. I ate the whole bag and my mouth was on blissful fire by the end. These have a great mix of garlic, onion, paprika, and various meaty flavors so the taste has depth until your tongue is too inflamed to detect them. I adored these. I'd buy them again in a heartbeat, but I'd try harder not to eat the whole bag at once next time. I've heard that some people find the Tyrant Habanero series too meek for their hot food needs, but I found it just about right. Recently, one of my students said that she waited in line for an hour to buy a modified Swiss cake roll. I asked her what made it so special that it was worth the wait and she said it was because the cake was not rolled in a swirl and was essentially like an omelet full of whipped cream. She said the whipped cream wasn't very sweet, so you could eat a lot of the cake without getting full. I never did extract a reason why being able to eat a lot of fattening cake was a bonus, but I told her that I would never wait in line to buy any food, no matter how popular it was. It's not uncommon for a particular food to become very popular as a result of being hard to get when it is initially released, and then for it to later be more fully available. 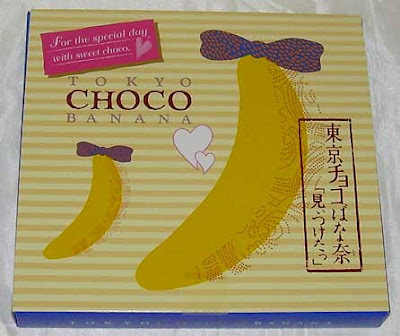 Things like this Tokyo Choco Banana start out that way. First, they are sold in one place only and become popular enough for people to wait in line for them. Later, they start to open up shops in other areas and finally they vanish because everyone gets bored with them. Incidentally, I discovered that the exact cake that my student waited in line for an hour to buy was available line-free at a local station. I don't have the heart to tell her about it though. 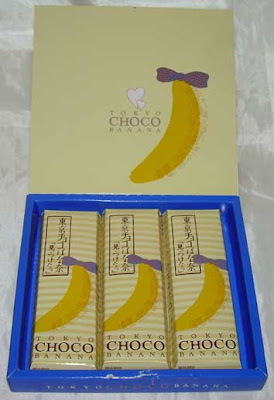 Tokyo Banana shops are mainly in major stations around Tokyo. The number of them has been steadily growing and their products' market infiltration has reached a point where select items are carried at all-purpose high-end sweets shops. My first encounter with their products was a sign at a tony store in my area that specializes in traditional Japanese treats. I actually heard of them quite a bit sooner than that via one of my readers, Nate; he had written to me last November and mentioned that he had bought a chocolate bar with a delicious banana cream filling. At that time, I hadn't come across this candy bar because it wasn't on offer at Tokyo Banana shops at that time. Clearly, it is either seasonal or available at certain shops only. My husband bought a box of 3 of these bars for 530 yen ($5.94) at Shinjuku station when he encountered them. He loves banana sweets, but I'm only so-so on them. The box is designed as a gift or souvenir and does not include calorie information. The web site, however, says that one 40 gram (1.4 oz. ) bar is 243 calories. Each square is about 48 calories. The ingredients are vegetable oil, sugar, whole milk powder, cocoa mass, cocoa butter, banana powder, maltose, lactose, skim milk, egg yolk powder, emulsifiers and flavoring. When I unwrapped the bar, I was greeted with a heavenly chocolate smell. It really had a terrific aroma. The first bite was of very strong banana at first and extremely fine, smooth, soft milky chocolate second. On the second bite, the banana flavor becomes slightly more subdued as the taste buds acclimate to it. The texture is wonderful for those who like fatty chocolates. It has a creamy center and smooth chocolate that feels rich and decadent on the tongue. Though I'm not a fan of banana chocolates, the texture of this really drew me in. My husband, on the other hand, found the banana flavor so intense that it came across as fake to him. 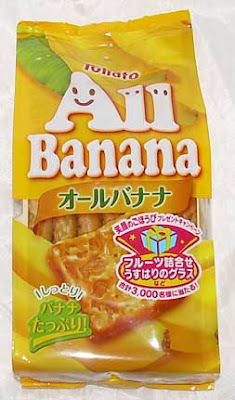 I think this is the sort of treat that one might take to or not based on how strong banana flavors are perceived. This was a real borderline product on the rating. My husband would have given it indifferent, and I actually would not be inclined to buy it again, but really did enjoy it. I gave it a grudging "happy" rating because it's so high quality and I did like it, but am unlikely to purchase it again for myself due to a low affinity for all things banana-flavored. Note that these bars can be purchased at the airport in addition to being available at scattered shops throughout Tokyo. They can also be bought on-line if you can read Japanese. This comes under the heading of "shameless self-promotion". The Japan Times interviewed me and has published a profile of me and both of my blogs (both this one and my 1000 Things About Japan blog). If you're interested, you can read it on the Japan Times web site here. "White Day" is today, March 14. For those of you who don't remember what that is based on my brief mentions of it in past Valentine's Day posts, it's a made-up holiday in Japan in which men give women sweets. Since the Japanese custom is for women to give men chocolate on Valentine's Day, this allows the confectioners to double-dip into consumer pockets. There is a plethora of White Day stuff on sale in shops as I write this. Much of it is actually white in color such as cookies, marshmallow snacks, meringue and white chocolate, but some of it is just plain old chocolate or other types of treats in new packaging. None of it is really anything special, and that's why I'm not reviewing any of those things specifically. Some of the offerings are little more than bags of marshmallows. I'm sure those will light some office lady's fire. White Day donuts and drink plus an image of the box of donuts you can buy with these special items included. 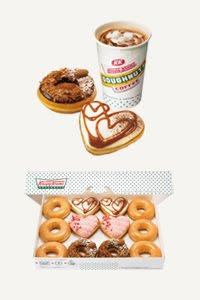 Image pinched from Krispy Kreme Japan's site. Not one to be left out of a marketing opportunity, Krispy Kreme has issued two specialty donuts for this holiday. One is the white chocolate caramel heart that you see above, mangled by the wax paper it was wrapped in. The other is a ring donut with chocolate frosting, crunchy chocolate flakes, and one lone little almond stuck on it. There's also a special drink, but it's just a "Ghana milk chocolate" drink which I'm pretty sure is plain old hot chocolate. My husband picked up the chocolate caramel heart donut on his way home from work (along with donuts he knew he'd like) because he was curious to see if it was any good. I was very skeptical based on my experience with their Valentine's Day donuts. The basic donut is just a plain raised donut with no filling. The coating is some sort of high fat white chocolate glaze which is dull and waxy. There's some cocoa powder on the right corner which is meant to artfully show a dusty pattern. There's also some caramel goo that they draw loopy hearts on the donut with. Of course, if you buy a single donut and it's wrapped up like ours, it looks like just plain scribbles rather than hearts. The donut smells like your basic donut. 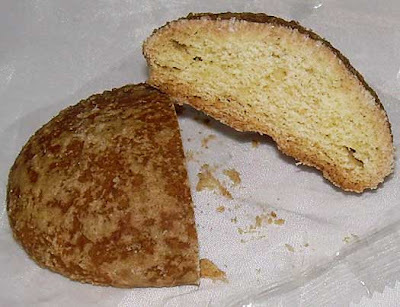 It was fresh and decent in terms of it's basic qualities as a baked good. That being said, that was about all it had going for it because there was very little in the way of taste. The white chocolate coating, caramel sauce and cocoa powder had almost no taste at all. They weren't sweet and mainly served to leave a kind of waxy coating in your mouth from the fats used in them (and those fats definitely did not include butter since there was no buttery flavor). This donut is 336 calories of disappointment and I wouldn't recommend it. My husband and I each took one bite and tossed the rest in the trash. I don't know what Krispy Kreme Japan's problem is, but they need to start making specialty donuts that taste like something. They don't have to be very sweet, but they could at least have some sort of actual flavor like, say, vanilla or caramel.